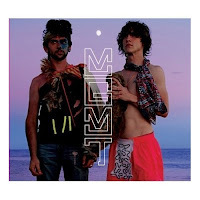 Two arty Brooklynites, Andrew Vanwyngarden and Ben Goldwasser, here combine meaty synthesisers, thundering psychedelic production, irritatingly catchy melodies and often caustic lyrics to offer up one of the first really fascinating albums of 2008. 'Oracular Spectacular' is full of rebellion, doomladen prophecy, a call to arms and a knowingness about the music business. It wears its influences clearly on its tripped out sleeves, an art-pop manifesto comprised of Bowie, Pink Floyd, Sparks, Bolan, The Stones, Prince, The Flaming Lips, Daft Punk et al and it's often incredibly bombastic, glamourous, naive, daft and represents a weird little bubble in time and space that threatens to burst and dissipate at a moment's notice. The superb production by 'The Flaming Lips' Dave Fridmann is full of scratchy, fuzzing drums and layers of washing, bubbling, keyboard sounds. The anthemic 'Time To Pretend' must be regarded as one of the best, inspiring pop songs to appear in the present desert of instant musical gratification. A shot across the bows at the shallowness of the celebrity pop star with its checklist of things to achieve - 'Let’s make some music, make some money, find some models for wives' - because let's face it all they're doing is 'pretending' to lead pop star lifestyles. This pretention is a tension that runs through the album as it careers from booming electro glam-stomp to wistful, psychedelic prog. 'Weekend Wars' is overtly David Bowie and could almost be an out-take from 'Hunky Dory' or 'The Man Who Sold The World' and has a lullaby structure with Jagger like vocals. “The youth is starting to change / Are you starting to change? / Are you / Together, together…” is the mantra on 'The Youth' with its more wistful waltz like structure, echoing vibes, buzzing and shimmering organs. 'Electric Feel' is a fantastic blaze of Bee Gees infected funk while 'Kids' is a marvellous nostalgic paen to playground ethics, full of meaty synths you can almost eat, lovely melodies, four to the floor drum kicks and soaring choruses. This and 'Time To Pretend' are the best tracks on the album. As a first half of the album these tracks are pretty sublime. However, things go a bit potty on the next half with less obvious stabs at pop and a more experimental and acoustic approach. Even so, there are still very catchy melodies and a sensibility that would put most bands to shame. '4th Dimensional Transition' is a tongue in cheek take on Floyd and Hawkwind where the beat count spirals up into a weird mutant form of disco. 'Of Moons, Birds & Monsters' proposes Neil Young going disco and sharing a stage with ELO. There's some lovely shimmering organ work on it, churning guitars, and great Sparks like falsetto singing. Often the formula of romanticising the end of the world and the freakiness of outer space pays dividends, but occasionally it wanders off into self-indulgence. The political dimension to their lyrics lacks a credibility because they have clearly adopted the Bowie-like need to role play and create fictional representations of themselves and it's really hard to be sincere whilst seizing on pretentiousness (the 'new school of pretention' as Eno and Bowie cheekily labelled it) as a vehicle. With this debut, I feel we only get an impressionist view of their true capabilities and there is a tendency to ignore the lyrics because the music itself is running through as many impressive dimensions and forms as it can. Sounds marvellous and definitely a band to watch.